Hangouts photos are not displayed in the new Google Photos (photos.google.com). However you can find your Hangouts albums in Google+ Photo albums or Picasa Web Albums the Google Album Archive (get.google.com/albumarchive). Having trouble finding your Hangout photos? Note: Google+ Photos will be retired starting July 29, 2015. You will still be able to find your Hangout albums in Picasa Web Albums after that date. As of November 19, 2015, links to Google+ Photos redirect to Google Photos, so the instructions below no longer work. 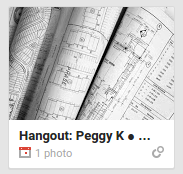 If you have a Google+ Profile your Hangouts albums will be in your Google+ Albums. Because Hangouts album are shared, you should see the album in the photos of anyone who participated in your Hangout. The number of photos shown is the number you shared, not the total number in the album. Note: Google+ Photos will be retired starting July 29, 2015. 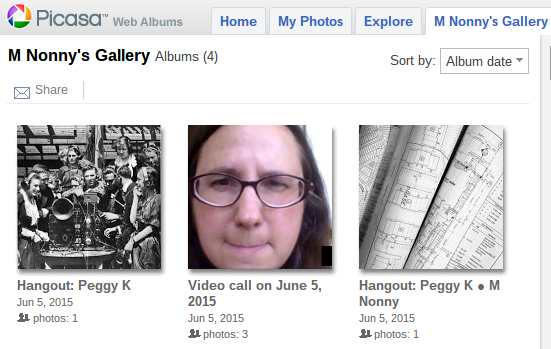 You will still be able to find your own Hangout albums in Picasa Web Albums after that date. 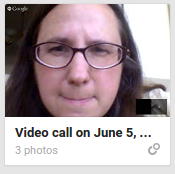 If someone else in a Hangout chat uploaded an image or someone else in a video call took a picture, the shared Hangout album should be visible in their Google+ Photo albums. You won't see any Hangouts albums there unless we've been in a Hangout together and I shared an image. Note: as of August 1, 2016 Hangouts Albums can only be accessed in the Google Album Archive (get.google.com/albumarchive). The instructions below will no longer work. 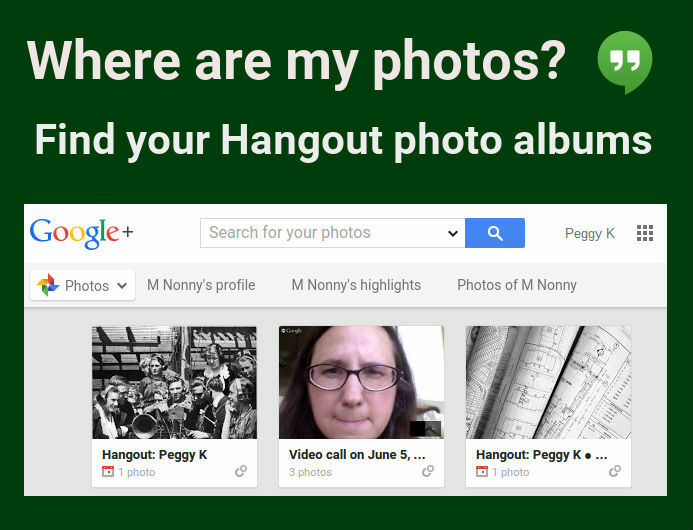 Hangouts albums are also displayed in Picasa Web Albums, whether you have a Google+ Profile or not. Because Hangouts album are shared, you should see the album in the photos of anyone who participated in your Hangout. Note that you must use the 21-digit user ID. Custom URLs will not work. Having trouble finding your Hangouts photos? A Hangout album is visible to all participants in a Hangout chat or everyone invited to a video call. 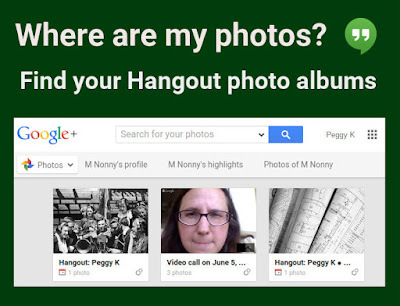 However, the Hangouts album will only be listed among your own photo albums if you contributed an image to it. If you cannot find the album on your own albums page, check the albums page for other Hangout participants. Photos shared when the Hangout history is turned off will only be temporarily visible in the shared album. After a short period of time, they'll be deleted from the album. 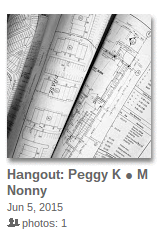 hi peggy, I'm not able to access hangout photos which others shared with me. I can see only those which I shared. Is there a way to retrieve them ?? And simple & ease option to see the Shared Multimedia with a particular Contact. i can't find nothing of multimedia i had share with a contact. 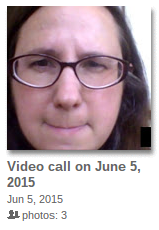 None exist anymore of multimedia of conversations of google Hangouts ?